Fortunately, Tree of Life has done just that. And not just one wine, but two: a semi-sweet and a semi-dry. They also make a pomegranate vodka and liqueuer. Very cool. So, what exactly is pomegranate? Well, it's one of the weirdest, yet most delicious fruits around. In addition, it's pretty tricky to cut open and eat, so thank goodness for having it in wine form! It has a hard outer layer, with a bunch of seeds contained inside, each surrounded by delicious little red casings filled with juice. I've heard it called an "alien fruit," and in some ways, it really is quite odd. But, certainly tasty. Like I said, Tree of Life makes two different varieties of pomegranate wine. For now, I am looking at their semi-sweet bottling. 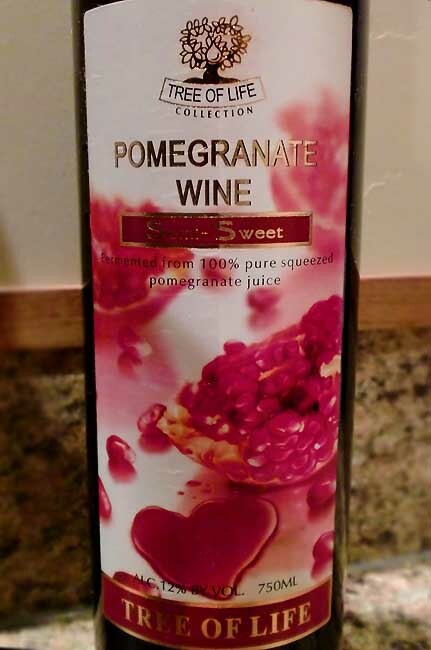 This wine is made in Armenia using 100% of a new variety of pomegranate that is harvested when it is fully ripened, letting the fruit's flavors shine. 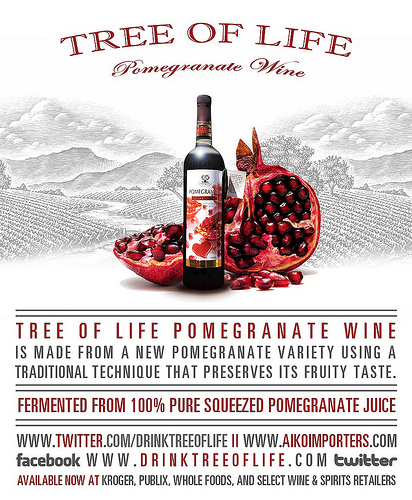 Tree of Life Semi-Sweet Pomegranate wine pours a translucent medium-dark red, just like you would expect. It smells actually quite mild, with the subtle aroma of pomegranate and raspberry. On the palette, it is really quite soft with tastes of smooth, sweet pomegranate, a bit of tang and a nice, clean finish. It's sweet, but not overly sweet, with the pomegranate flavor front and center. My wife (who doesn't like regular red wine) thought this tasted pretty good. Personally, I found it to be far and above better than I was expecting! I've had my share of fruit wine (strawberry, watermelon, etc.) and this was considerably better than any of those. This is something wine-lovers and those who don't like normal wine could drink and enjoy. 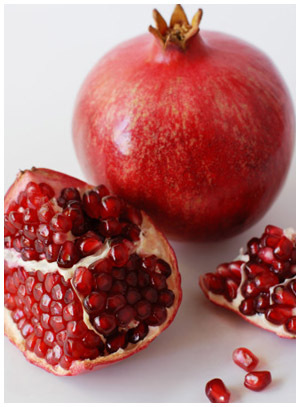 It's easy drinking, smooth, and fairly sweet without being too sweet, with the wonderful taste of pomegranate. Great stuff. I will have to track down another bottle, and perhaps give the semi-dry a try, too. It's definitely worth trying. Go check out Tree of life on their Facebook and Twitter pages. Here's their website, as well. Tell them Bob sent ya! Drink This: if you want to mix up your normal wine routine with some pomegranate wine. Like I said, this fruit wine is easy-drinking and tasty enough that even those who don't like normal wine will enjoy it. Don't Drink This: if you don't like pomegranate. But seriously, who doesn't like the wonderful taste of pomegranate? hi. i had this wine once when i was living in CA, but now i live in MD. and i dont find this brand here. could you please tell me who has this brand in MD. or at least tell me how I can buy it online? Or like the person below me said, they found it in Rodman's Chevy Chase DC. It's definitely a tricky wine to track down! Hi Mozhgan, i do not know if you found that or not but i bought this wine yesterday from Sprouts, hope you will find that. I found this at Rodman's Chevy Chase DC the other day. I just had some of this, which i purchased in a market in San Jose CA. it's the semi-sweet version and it's like drinking cough syrup.